Wayne State University Press, 9780814333136, 369pp. The rich variety of activities for word retrieval and problem solving in the Workbook for Cognitive Skills has made it a favorite of clinicians over the past twenty years. The second edition of the "red book" builds on the original by adding 70 pages of entirely new exercises and 1,000 rewritten questions. 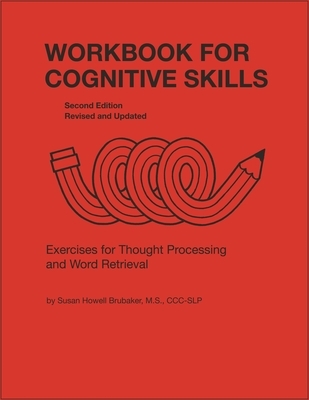 Responding to the comments and suggestions of longtime users, the second edition of the Workbook for Cognitive Skills also features a sturdy ring binder that allows for trouble-free copying of exercises, a new page layout that is easier to read, and divider tabs that make it simple to find different sections. This book is divided into six different target areas (Word Formation, Familiar Phrases, Definition Usage, Visual Recognition, Letter Placement, and Logical Solutions) with exercises of varying length and complexity that can be completed in any sequence. The book also includes a useful CLUES section, which provides examples of strategies for working through exercises and allows those who do not have spelling or writing skills to use the book. While some patients will only require CLUES to suggest strategies to successfully complete some of the most difficult exercises, others can use the CLUES section for the multiple-choice answers or for checking their work. The puzzles and exercises in the Workbook for Cognitive Skills are designed to be fun as well as challenging, and the use of everyday terms, names, and titles make this workbook relevant and timely for both adolescents and adults. Clinicians who work with patients with aphasia, cognitive impairments, or word/memory loss will be grateful for the new edition of this popular workbook.